This topic contains 3 replies, has 4 voices, and was last updated by pmossberg 9 months, 1 week ago. Hi, we are both new members and proud new owners of a 1951 MGTD replicar. It has a 1981 Chevy Chevette driveline. It is exceptionally well built and probably was built in a factory. We have researched all of the known kits, and it does not appear to have built by any of them. We believe it is a one owner car and we know it was registered in San Francisco area for the majority of its life. 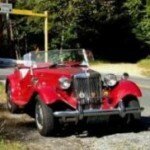 How would we go about determining the history of the car such as the manufacturer etc. 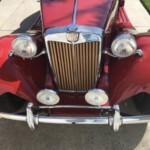 It is one of the finest examples we have seen with authentic MG parts for almost the entire vehicle. The body is fiberglass except for the hood which is metal and appears to have the original type latches. It has bolt on wire wheels. Nardi steering wheel, Stewart Warner gauges, all chrome authentic MG parts including glass tail lights. Would the 10 digit VIN provide clues? Any advice or leads on how to determine her ancestry is greatly appreciated. Nice looking car. I see you have open lovers on the front side panels. Do they lift up as part of the center hinged hood? If so, I am interested in photos. Sorry, I’ll be of no help in researching its history. Good Luck, on your search and welcome to our family, You’re gonna love it here! Dang, that’s a nice looking car. From the one side picture, it sure looks like an original TD. Top, curtains, engine cover side panels, rear tank, tank supports…are all looking spot on. You sure that’s a Chevette drivetrain? LOL! Not sure CarFax will be much help with replica vehicles.